Good day my friends. Hope everyone is staying warm. It is 20 below zero here. I am sooooo ready for warmer weather. 40 degree days are going to feel like a heat wave when you have this cold of weather. I just wanted to post a little spot in my cozy little depot that I did today. Easter will be here before you know it. So here is what I did. I have always loved show and tell how bout you? I found an old, old children's fables book, which if you ever read children stories from years ago they are actually frightening! I would never think of reading some of those stories to my grandchildren for fear they would get nightmares. So, anywhoooo, as I was thumbing (this must be my word of the week or something) I came across an picture of wabbits! I thought to myself, BINGO! This would be cool to use with my wabbit. So there you have it. I took a few more photos but for some dang reason I could not get them to download. I will keep trying to give you another angle. Well, I guess that I'd better get some supper ready for the Mr.. I think it's going to be a soup night. Ta ta for now. No I'm not related to Babwa Wawters. I'm saving your picture for Easter decoration inspiration. Thanks! Oh I love vintage children's illustrations. They often look sweeter than the actual story. Try downloading Windows Live Writer (assuming you're using a Windows based computer). It's free. I use if for nearly all my posts; photos upload quickly and I rarely have trouble sending it to my Blogger account! 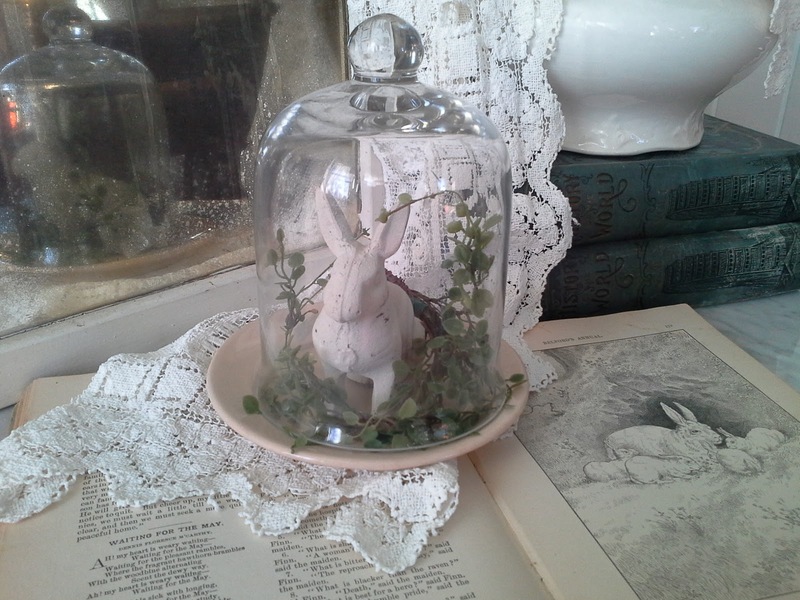 Love your rabbit under the bell jar and pared with that illustration, it is perfect! I think some countries used fairytales as a form of mental warfare on kids minds to make them behave. Kind of like "the moral of the story" on steroids! lol I sure wouldn't go wandering into the wood leaving bread crumbs after learning of a witch who might want to eat me! Very pretty! It's frigid here too, -6 and snowing. The schools were canceled across most of the Western UP. Too cold for the kiddos to be outside waiting for the buses. I need one of them glass domes. Spring looks a long way away where I live.